This is a FREE mountain bike event designed to ALL levels of riding – the rugged adventurer, the regular weekend warrior and the parent and kids who ride a few times a year. The intent is to bring the Taos cycling community together for a fun, casual, non-competitive day of riding on some of Taos’ best singletrack. Build community, make new friends, ride one of Taos’ best kept secrets, and enjoy nature and supreme BLM singletrack! It’s FREE so everyone can enjoy. Brought to you by the Field Institute of Taos, in partnership with Del Norte Mountain Bike Association (our local IMBA chapter), and sponsored by loads of local businesses. We’ll be ready to get folks started at 10am on event day, but if your coffee is extra tasty that morning, or maybe you were out too late at Taos Mesa Brewery after packet pickup the night before, you can come anytime your legs will let you. That’s how cool we are, ride as much or as little as you like. This event is for all levels of riding and all age groups. There are three different courses: a 12+ mile loop for more advanced and athletic intermediate riders, a 4 1/2 mile for novice adults and kids who can ride some singletrack, and a kiddie loop in the the parking area for strider bikes, training wheels, and kiddos that aren’t ready for full on singletrack. You can ride alone, called solo, and do all the miles by yourself. Or, you can ride on a ‘team’ with another person as a duo and trade on and off between laps. Any age and gender groups determined race morning, once we see who shows up. There aren’t any official prizes, but we do have swag to award to the folks who ride the most miles between 10am-4pm. This is Taos, we do things on our own time, and mañana doesn’t necessarily mean tomorrow, it just means not right now. Get the feel? Helmets required! EMS and Search and Rescue will be at the event, but you won’t need it, right? Neutral support will be available on site. Ride sweet, flowy singletrack (85% on long loop) mixed with double track (15% on long loop) along the rim of the Rio Grande Gorge. Rolling terrain in sagebrush, piñon and juniper. The staging area is at the end of County Road 110 (past the Taos Country Club). This road used to descend into the gorge until a huge rockslide closed it for good in the ’90s. Preregistration is encouraged so we can order enough burgers and beer but you are welcome to register on site as well. T-shirts are $15 in advance (via registration) or $20 at the event. Please register even though the event is fabulously free. Support ur Sponsors making this event possible. This is an IMBA Take A Kid Mountain Biking Event so bring your kids to ride! The Taos Land Trust is sponsoring a barbeque at the event! Free hamburgers for participants! Taos Cow will be scooping free ice cream! Mountain Khakis, Gearing Up, and Taos Cyclery are donating items for prizes and to give away! Cid’s Market is supporting us with food for helpers and on the course! Taos Sports Alliance and USBank are generous contributors! This event is organized with 100% volunteer support. Bike Swap! 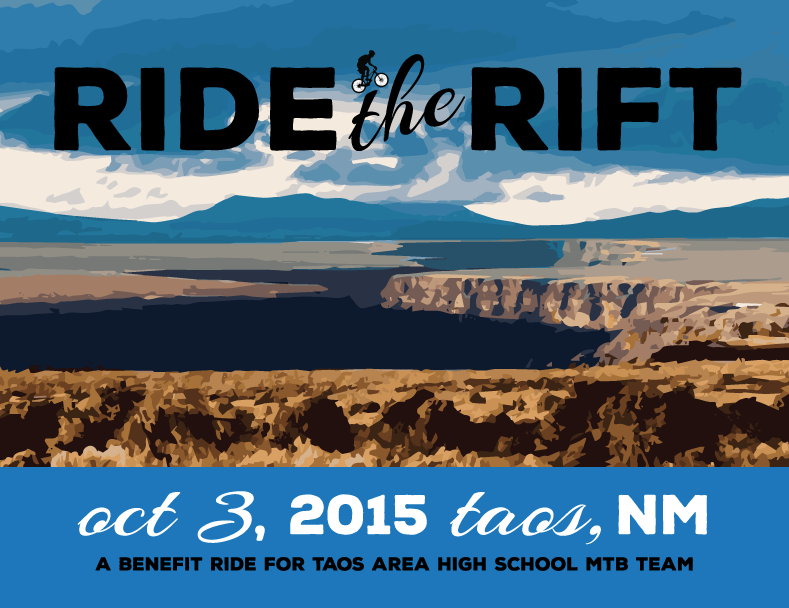 Taos Bicycle Advocates is sponsoring a Bike Swap during Ride the Rift. Anyone and everyone is welcome to bring their biking gear and bikes to sell, and you are encouraged to bring cash to purchase items from the swap. It’s as easy as bringing your stuff, setting your sale price, and dropping it off at the Bike Swap tent on Saturday, October 3rd. Go ride while your stuff is sold. Check out the details Facebook or email the swap organizer.